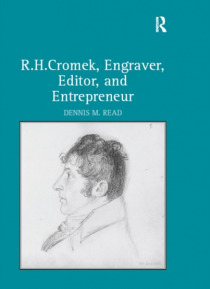 Based on meticulous archival research, Dennis M. Read's study offers the most accurate and thorough account to date of the engraver, editor, and arts enthusiast R. H. Cromek. Though he is best known today as William Blake's nemesis, Cromek made significant contributions to the vitality of the arts in nineteenth-century Britain. Read traces Cromek's early years as an accomplished engraver, his coll… aborations and falling out with Blake, and his editing and publishing ventures, showing him to be a pioneer who recognized the opportunities of the emerging market economy. Read's descriptions of Cromek's disastrous associations with the Chalcographic Society, his publication of Robert Burns's unpublished works, and his duping by the perpetrator of a literary hoax make for fascinating reading and tell us much about the commercial art and publishing scenes in England and Scotland. Perhaps most important, Read salvages Cromek's reputation as an unscrupulous exploiter of Blake and others. A fuller and more balanced portrait emerges that shows Cromek's efforts to bring the arts to emerging cities of the midlands and beyond, describes his friendships and associations with luminaries of the fine arts and literature such as Leigh Hunt and Benjamin West, and challenges more biased reports of his successes and failures as an entrepreneur.